Galatasaray Odeabank Istanbul showed its great pride again in stunning fashion on Friday by roaring from behind to defeat Olympiacos Piraeus 71-80 on the road in Greece. It marked the second time since it was eliminated from the playoffs race that Galatasaray defeated a top-three team in the standings, after its home win over Real Madrid two rounds ago. 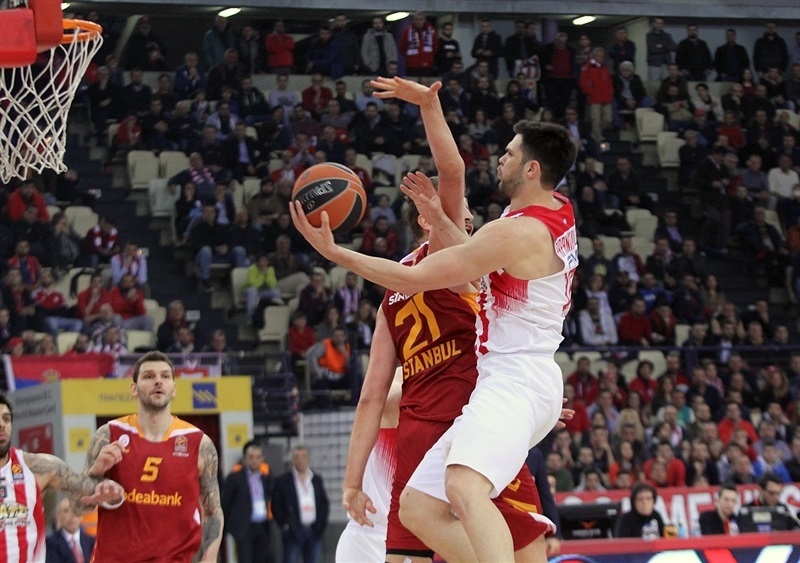 This time, Galatasaray shook off a 15-point deficit right after halftime to outscore playoff-bound Olympiacos 21-45 the rest of the way and sweep its two games against the Reds this season. 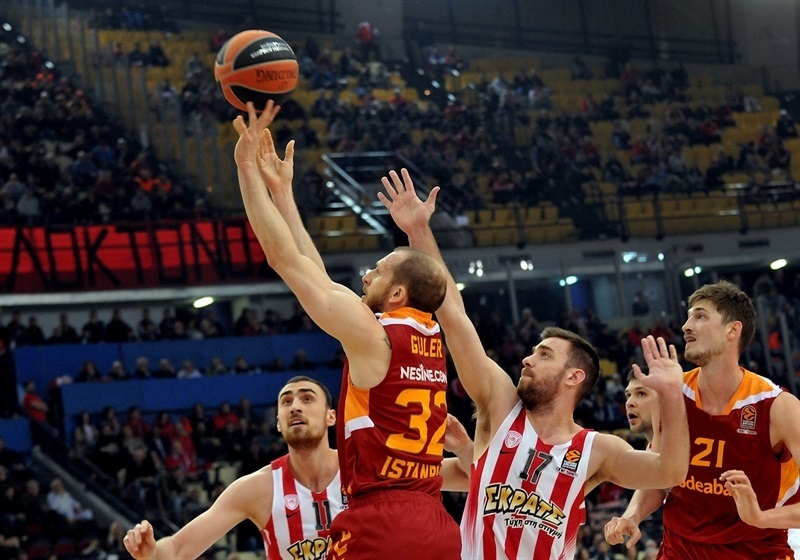 Galatasaray improved to 9-17 and moved up to 13th place, while Olympiacos fell to 18-8 and at least delayed its objective of securing home-court advantage in the playoffs. Vladimir Micov hit 4 of 5 three-pointers, including back-to-back game-deciders in the last 2 minutes, to lead the winners with 18 points. He also had 5 rebounds, 5 assists and 4 steals. Alex Tyus followed with 14 and Goksenin Koksal 13 for Galatasaray, which made 10 of 16 threes as compared to 2 of 20 for Olympiacos. The Reds got 14 points each from Erick Green and Georgios Printezis but otherwise failed to capitalize on their big early lead which was built on the first dozen of a club record 22 offensive rebounds. Micov made a jumper off a steal to open the scoring before a put-back by Printezis tied the score. 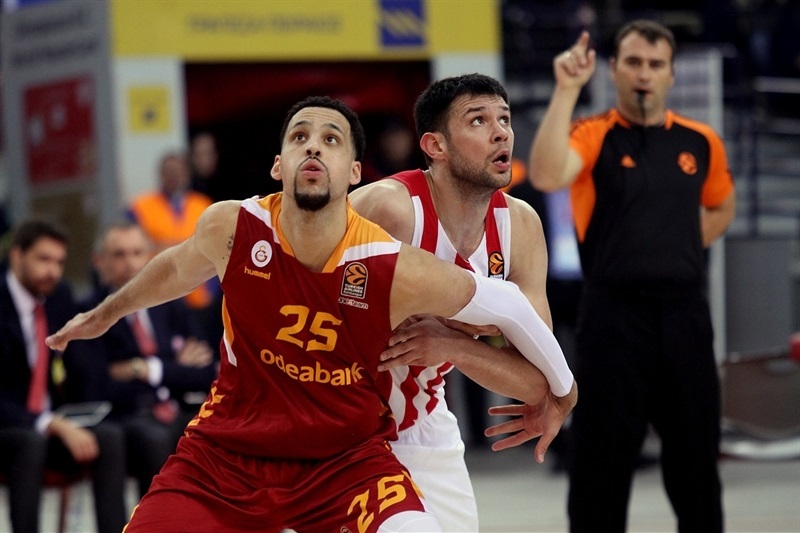 Austin Daye scored over the backboard but Khem Birch matched him before a free throws by Vassilis Spanoulis gave Olympiacos its first lead, 5-4. 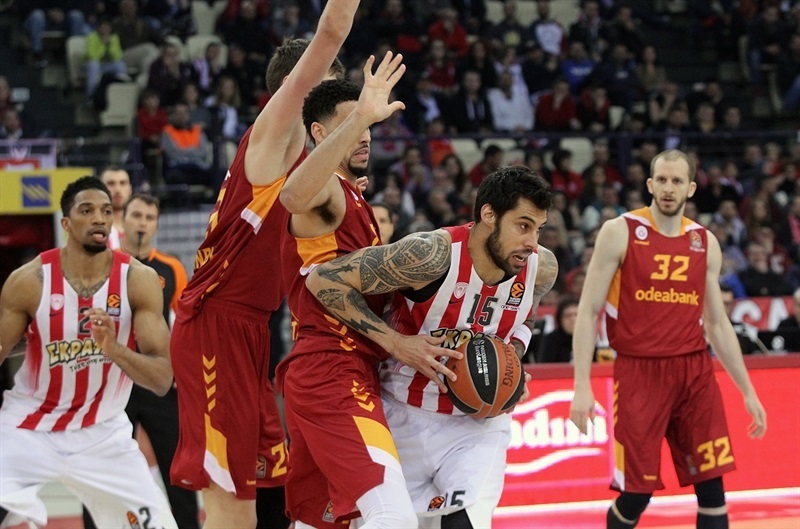 Printezis finished a three-point play on the break and Spanoulis scored again as the lead quickly hit 10-4. Sinan Guler found Tibor Pleiss for a slam and hit the game's first triple at 12-9. Pleiss and Kostas Papanikolaou traded inside baskets before the latter dunked to finish a fastbreak. Spanoulis fed Nikola Milutinov next as the lead hit 20-11. Printezis pirouetted for another basket before Bruno Fitipaldo hit a triple that Green matched for Olympiacos as the hosts took a 27-14 lead after 10 minutes. Fitipaldo struck from deep again to open the second quarter, but Dimitris Agravanis took a highway to the basket and completed a three-point play at 30-17. Tyus slammed an alley-oop in style but Green's back-to-back baskets extended the difference to 34-19. Koksal hit free throws and fed Tyus for another dunk, but a third-chance possession by Olympiacos, which already had 11 offensive rebounds, ended in a dunk by Birch. The exchange of baskets continued non-stop to 44-32 as Ege Arar and Can Korkmaz combined on 6 quick points for the visitors. 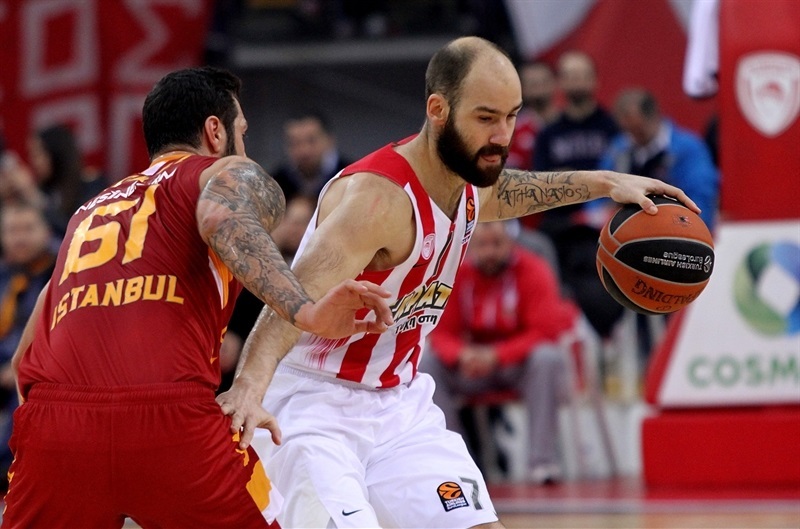 Spanoulis answered with a layup and free throws as Olympiacos went ahead 48-35 at the break. 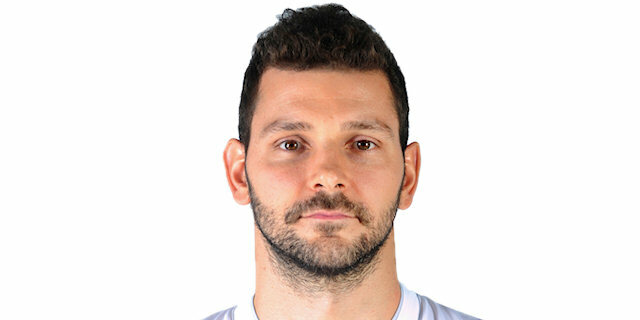 Papanikolaou fed Milutinov as Olympiacos reached 50 points to start the second half. A looping alley-oop dunk by Pleiss was followed by Printezis and Koksal scoring on the break, then Papanikolaou scored easily inside to make it 54-39. 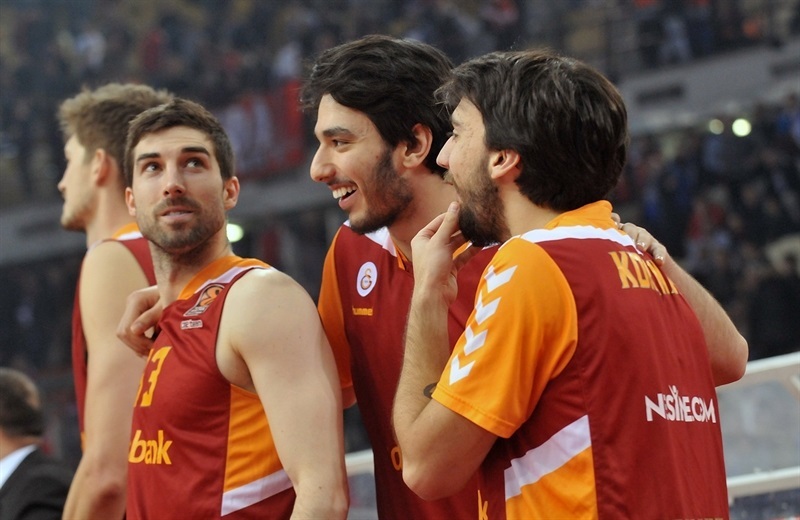 Galatasaray continued making things happen with Koksal scoring 8 quick points to cut the difference to 55-46. Guler cut it further from downtown as Olympiacos kept missing until Dominic Waters appeared with his first basket at 57-49. Daye answered with a two-pointer and Micov stepped out for a triple to suddenly make it a three-point game. Galatasaray's comeback was complete when Daye buried a transition triple to complete a 2-11 run to make it 57-57. 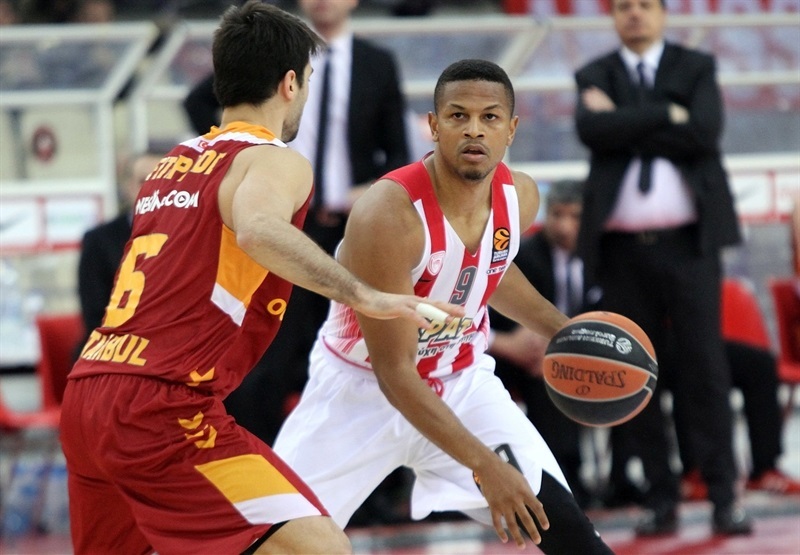 Only another jumper by Waters let Olympiacos escape with a 59-57 advantage after 30 minutes. A tip-in by Tyus opened the fourth quarter and then he dunked a feed from Micov for Galatasaray's first lead since the opening minutes, 59-61. Matt Lojeski responded with a three-point play for Olympiacos and then Green hit a runner in the lane to settle the hosts at 64-61. 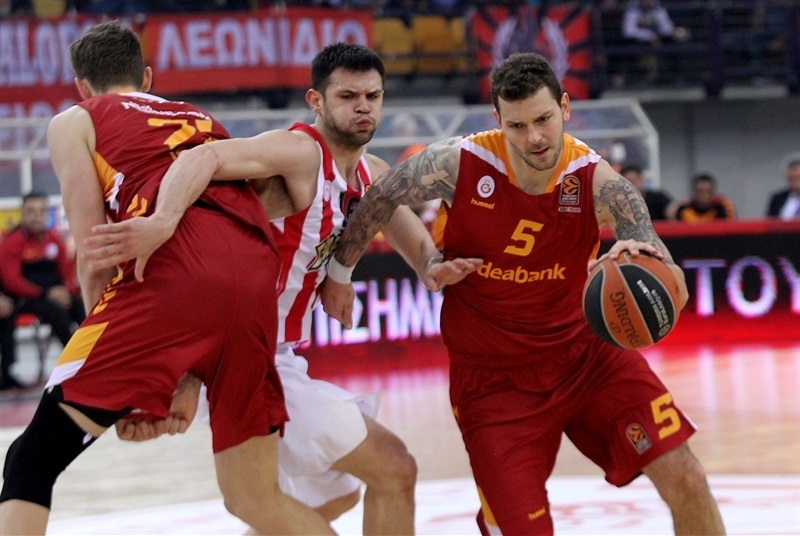 But Micov was ready with a tough triple to tie again, 64-64, with 7 minutes left. Micov then made a pair go-ahead baskets around a put-back dunk by Patric Young for a 66-68 scoreboard with 4 minutes left. Spanoulis set up Green for an open triple, just the second of the night for Olympiacos, to retake the lead, but Guler took it right back with a driving layup at 69-70. Then Micov kept stroking from the arc with back-to-back blasts from the same spot for a 69-76 advantage with 1:14 left. 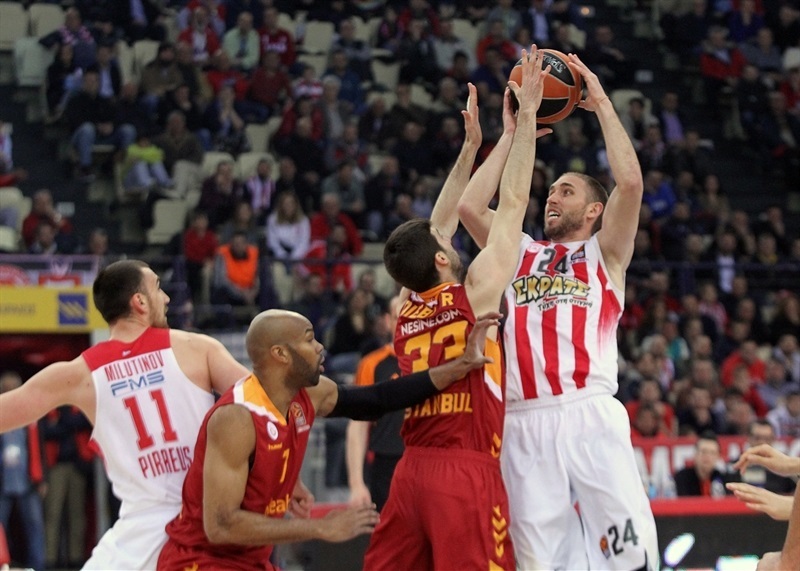 Printezis ended almost 3 scoreless minutes by Olympiacos with free throws, but only 52 seconds remained. Daye hit just 1 of 4 free throws for the visitors, ending his personal streak of 27 in a row made, but Olympiacos kept missing it shots as Galatasaray kept adding to its lead for a season sweep of the Reds. 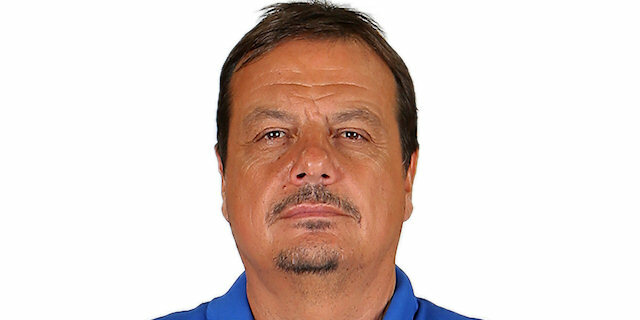 "A bad second half, one in which we were not aggressive and didn't play good defense, although at halftime we had discussed the defensive part of the game and the fact that Galatasaray is very dangerous and can find a rhythm and can come back easy if we are not tough. From the other side, offensively, we were a lot of times open to shoot. We missed three-point shots, we missed layups, easy points under the rim and away from it. That caused us big nervousness to be tough on defense. We continue. We are in a position where we control the situation. We have four games until the end of the regular season, and this is a good lesson and a good result, from the point of view that everyone had already started to talk like we had made the top four. The only thing we've done is qualify to the playoffs and we have to fight until the end, until the last game day, to have the home-court advantage. This is the next goal that we put until the end of the regular season. This is what I've said before the game, and unfortunately all the atmosphere around was cheering before we should have done this. We continue and we must focus on the next games." "Except the first quarter, we played a great game. We beat them by a 20-point difference except for that quarter. At halftime, we said in the locker room that we must improve, especially our defense in the paint. And we were successful. We didn't let them get easy scores in the second half in the paint. We had said this also before the game. We missed the first quarter, then played great and got confidence. This EuroLeague for us has been very strange. We came here to play good basketball, that's all. The first quarter we play terrible, then we start to play good, and in the second half, we understood that we have a chance to win the game. 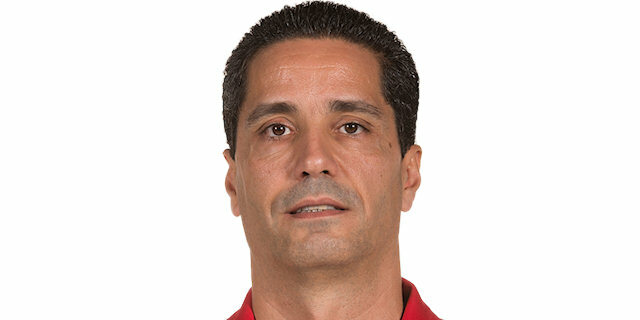 We got the victory, so congratulations to my players." "Of course, it's not easy for us to get good motivation before the game, because we lost our playoff chances. And for this reason, I think we start the game terrible in the first quarter. And after the first quarter everyone who watched the game and here, everybody thinks that tonight we would lose by 30 or 40. But basketball is a strange game. After I saw this in the first quarter, that our starters were not motivated for the game, I put all reserve players for the second quarter, and they didn't give up. This gave us energy for the second half. In the locker room at halftime, we said we are playing a EuroLeague game and we must play more aggressive. Our biggest mistake in the first half was the paint, where we gave up 12 offensive rebounds and had only 9 defensive rebounds. We didn't start the second half good, either, but after we changed Tibor Pleiss with Alex Tyus, we got more energy and more protection in the paint. We tried to make a good defense against the Olympiacos pick-and-roll. We protected the boards, especially with Alex Tyus. We got good spacing on offense and we got lucky tonight because we made 10 three-pointers in 16 and Olympiacos had only two in 20. So we got control of the game, and it was a surprise for everybody, but we played good basketball and we enjoyed this victory." "We lost the chance for the playoffs, but we already said we will fight until the end. We'll probably mess up the top eight teams, because we won against Real Madrid and now twice against Olympiacos. I think they relaxed too much in the second half, because they were up 13 at halftime. I think they stopped playing aggressively. On the other side, we played hard and scored some incredible shots, I would say. And of course in the clutch moments, we really played smart defense and on the offensive end we moved the ball. In the end, it's hard to call it a very important win, because we can't change our situation, but like I said, we are going to fight until the end."